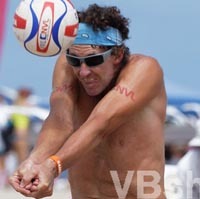 David competed 10 seasons on the AVP Tour, his most successful being 2003 teaming with Jason Lee to reach the Quarterfinals of all 3 major Southern California events, Hermosa, Manhattan and Huntington. He began his career in 1995, teaming with his brother Aaron Smith for the better part of 4 seasons prior to a stint playing indoors in Europe. The brothers paired for many strong finishes both on the AVP and off, including 4 finals appearances in season ending Aspen Motherlode Volleyball Classic. Upon returning from Europe, brother Aaron had retired to pursue academic pursuits, David formed a successful partnership with John Anselmo prior to playing with a variety of other players including Jason Lee, John Moran and Hans Stolfus. He retired from full time competition following the 2005 season to focus his efforts on a career in Real Estate. David did return to extensive amateur competition in late 2009 and has vigorously pursued that level of play, hopes to make a return to full-time National Level competition in 2012. Smith played Collegiately at San Diego State where he captained a team including current beach player John Hyden and brother Aaron. He is a native of Denver, CO where he began his career and currently resides. David contributes to the robust Colorado Sand VB scene by running events at his hometown Lakewood Park Sand courts as well as coaching local junior players. Other interests include tennis, golf, hiking, biking, poetry, chess, reading, and climbing on things.